While sitting on an airplane flying to my CE lecture destination, I got to thinking...working in a veterinary hospital is a lot like flying in an airplane. You may be saying to yourself, what? Flying in an airplane? Working in a veterinary hospital? How do those remotely make sense? Food. HA! Have you been on an airplane recently? No longer are you served food… a meal... on an airplane. A meal during your shift? HA! Long gone are the hour-long lunch breaks during your work day. You are now lucky if you are offered a bag of peanuts or a handful of pretzels when on the plane or in between appointments! Turbulence on an airplane is unavoidable and often unexpected. Similarly, in the hospital, no matter how well you plan your day, there is the risk of turbulence. Emergency cases "walking in" to general practice. Cases where the diagnosis is not favorable. Financial concerns for clients. Work place personal conflict. Whether on an airplane or in the hospital, at the end of the day you hope that the turbulence is brief and leaves behind no scars. Whether it is the passenger 2 rows in front of you that decided it would be a good idea to air out their tootsies... the lack of airplane etiquette where someone opens their smelly tuna sandwich, or the curious case of diarrhea somewhere in the hospital… smells are everywhere. Whether a small carry-on of issues or an overweight, 75 pound bag with a $100 penalty to get it on the plane... everyone you work with has baggage. My recommendation: maybe it's best to pack lightly and leave most of your baggage at home...both when flying and coming to work. Ok - so now you think we are pushing it. Flight attendants? How does a flight attendant apply to a veterinary hospital? Although the veterinarian (pilot) is important, the nursing staff (e.g., flight attendants) are what make the ride enjoyable. You see more of the flight attendants during the flight, rarely seeing the pilot. While I hope you see more of the veterinarian than the pilot, the nursing staff remains the most visible member of the veterinary team, an irreplaceable part of the support staff. So yes, the nursing staff is what makes the (veterinary) ride enjoyable. Do you have other thoughts of how working in a veterinary hospital compares to flying on an airplane? I love finally landing and knowing that I’m finally home again! All the turbulence , the lack of sleep, the hustle, the bustle. Waiting while your row is ready to file out one by one. I’M HOME! Or coming from a night shift in the ER straight to the airport. Tried to sleep in my seat when the guy next to me starts moving around. I wake up just in time to notice him touching his chest and going limp. I drag him into the middle of the plane and start chest compressions….vacation started very much like work. A GP came over to help me. To my eter al shame she did travel with her stethoscope.. So true about the baggage. 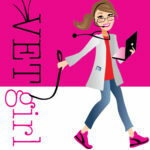 Veterinarian has the toughest job but being a vet doctor is the most noble job in the world. Couldn’t agree more! Labor of love!